Even if your working environment is short on surface space, it doesn’t mean you can’t have the benefits of a bottled water dispenser. Whatever your office size, installing the AquAid AQ Max means you can still enjoy refreshing spring water on demand. This attractive and compact unit, available as either Hot & Cold or Cold water only, fits onto most desk, table and counter tops. It includes all the essential features you would expect from a bottled water dispenser: such as an adjustable thermostat and silent running, in a compact and elegant design. This combination of great features and space-saving design has made the AQ Max Desktop extremely popular in offices and kitchen areas. 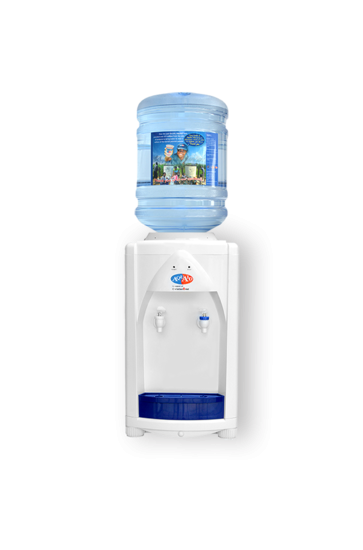 The AquAid AQ Max is available as a Free Standing Bottle Fed Dispenser. Spring loaded taps with a safety hot tap. We aim to schedule both the installation of your water cooler or dispenser and any deliveries at your earliest convenience. We are generally able to deliver desktop bottle-fed water dispensers or coolers within 48 hours. The installation of the AquAid AQ Max Desktop Bottle Fed Water Dispenser doesn’t just benefit you though. On average, every AquAid water cooler installed will provide four people with water every year.